Our vision is to supply a trusted source of grass fed beef to hardworking Alberta families like our own. 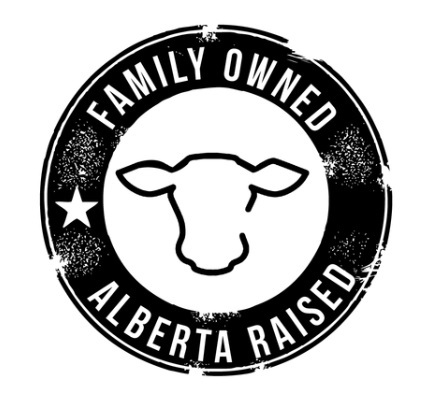 Using the ranching traditions started by our parents and grandparents, we aim to provide nutritious products from healthy, happy animals raised on rich Alberta prairie soil. Before starting our journey towards grass fed beef, we asked ourselves: How can we create a product that is good for our animals, good for our environment, and good for our customers? We are committed to creating a healthy, thriving environment for generations to come through regenerative farming practices. We treat our farm like an ecosystem, and our cows play the most important role. Grazing animals improve grassland ecosystems by cycling nutrients, building soil and enhancing plant root systems. Properly grazed grasslands can sequester a significant amount of atmospheric carbon in the soil through plant roots. How do we improve our pastures? In the warm season, we utilize rotational grazing allowing the cattle to consume only half of the plant height before moving them on to fresh pasture. Grazing at 30-50% of the plant height stimulates rapid growth of the plant roots, increasing soil carbon and feeding soil microbes. Soil microbes, in turn, convert soil organic matter into nutrients that the plants require for growth. We continue to work towards healthier soils and pastures which we believe reflect in the health of our cattle and the quality of our beef. Our family has a long history of raising cattle and eating beef. We know that regardless of what cattle are fed, red meat is nutrient dense. It contains vitamins A, B6, B12, D, E, minerals like iron and zinc, and essential amino acids. However, research has shown that finishing cattle on a grass fed diet has several health benefits for consumers. Two to three times more conjugated linoleic acid: a healthy fat that's been tied to improved immunity and anti-inflammation. Higher concentration of omega-3 fatty acids: essential fatty acids that have been associated with reduced risk of cardiovascular disease, cognitive decline, and other conditions. ethically raised <br> grain free <br> no added hormones or antibiotics <br> no GMO feed <br> grass finished <br> Animal care is our top priority. We believe in creating a comfortable, natural environment for our cattle, using low-stress handling and herding methods. Gemstone cattle are born and raised on our farm and enjoy a natural, grain free, nutrient rich diet free from added hormones. In the winter, the cattle remain free to roam in large fields, but are also provided with wind shelter and straw bedding for protection during storms and extreme cold. <br><br> In the spring, summer and fall, our cattle graze on a variety of lush, nutrient dense grasses and other forage. We rotate them through our open pastures often, so they can eat the most nutritious parts of the plant, resulting in high-quality beef that our customers desire. <br><br> To maintain health and growth, cattle finished in the cold winter months are fed a mix of green hay and silage. Silage is chopped up grass, or other green fodder, that is preserved over the winter by airtight fermentation to prevent spoilage. Just like canning vegetables or fruits! Small quantities of sunflower seeds, rolled flax or malt sprouts may also be added for extra energy and nutrition. <br><br> Good for our Customers It contains vitamins A, B6, B12, D, E, minerals like iron and zinc, and essential amino acids. However, research has shown that finishing cattle on a grass fed diet has several health benefits for consumers. <br><br> Some of the health benefits of grass fed beef include: <br> Higher in Vitamin A and E: powerful antioxidants that support healthy vision, skin, bones and other tissues in the body.<br> Two to three times more conjugated linoleic acid: a healthy fat that's been tied to improved immunity and anti-inflammation. Higher concentration of omega-3 fatty acids: essential fatty acids that have been associated with reduced risk of cardiovascular disease, cognitive decline, and other conditions.<br> More desirable omega-6 to omega-3 ratio: Health professionals suggest that a healthy diet consists of 1 to 4 times more omega-6 fatty acids than omega-3 fatty acids. While essential for normal body function, excess amounts of omega-6 can cause inflammation in the body. Studies have shown that grass fed beef repeatedly falls within the healthy 4:1 ratio of omega-6 to omega-3 fatty acids. ethically raised <br> grain free <br> no added hormones or antibiotics <br> no GMO feed <br> grass finished <br> <br> Animal care is our top priority. We believe in creating a comfortable, natural environment for our cattle, using low-stress handling and herding methods. Gemstone cattle are born and raised on our farm and enjoy a natural, grain free, nutrient rich diet free from added hormones. In the winter, the cattle remain free to roam in large fields, but are also provided with wind shelter and straw bedding for protection during storms and extreme cold. <br><br> In the spring, summer and fall, our cattle graze on a variety of lush, nutrient dense grasses and other forage. We rotate them through our open pastures often, so they can eat the most nutritious parts of the plant, resulting in high-quality beef that our customers desire. <br><br> To maintain health and growth, cattle finished in the cold winter months are fed a mix of green hay and silage. Silage is chopped up grass, or other green fodder, that is preserved over the winter by airtight fermentation to prevent spoilage. Just like canning vegetables or fruits! Small quantities of sunflower seeds, rolled flax or malt sprouts may also be added for extra energy and nutrition. <br><br> Good for our Customers It contains vitamins A, B6, B12, D, E, minerals like iron and zinc, and essential amino acids. However, research has shown that finishing cattle on a grass fed diet has several health benefits for consumers. 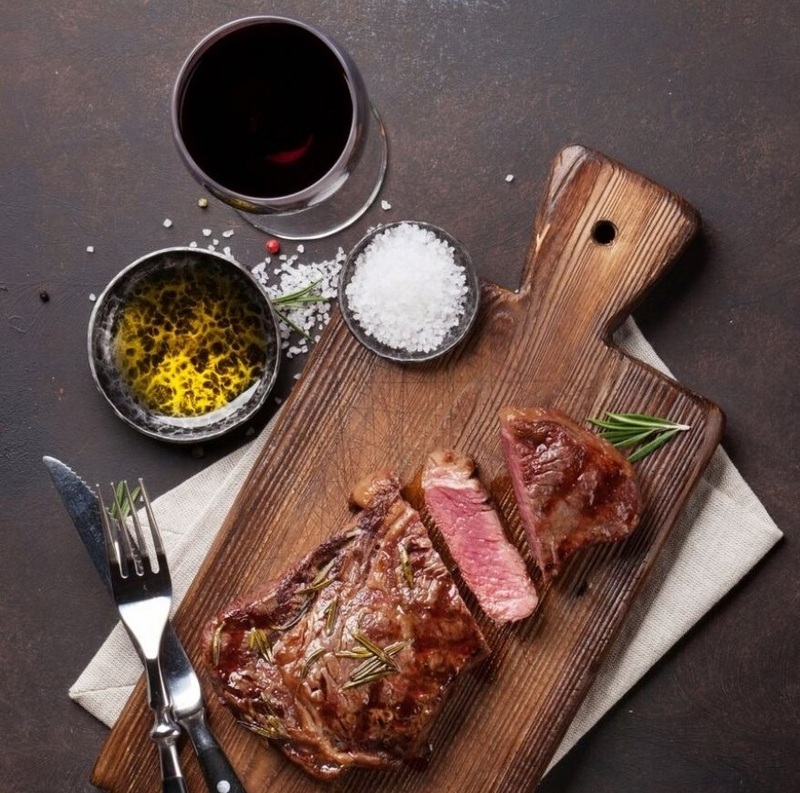 <br><br> Some of the health benefits of grass fed beef include: <br> Higher in Vitamin A and E: powerful antioxidants that support healthy vision, skin, bones and other tissues in the body.<br> Two to three times more conjugated linoleic acid: a healthy fat that's been tied to improved immunity and anti-inflammation. Higher concentration of omega-3 fatty acids: essential fatty acids that have been associated with reduced risk of cardiovascular disease, cognitive decline, and other conditions.<br> More desirable omega-6 to omega-3 ratio: Health professionals suggest that a healthy diet consists of 1 to 4 times more omega-6 fatty acids than omega-3 fatty acids. While essential for normal body function, excess amounts of omega-6 can cause inflammation in the body. Studies have shown that grass fed beef repeatedly falls within the healthy 4:1 ratio of omega-6 to omega-3 fatty acids. ethically raised <br> grain free <br> no added hormones or antibiotics <br> no GMO feed <br> grass finished <br><br> Animal care is our top priority. We believe in creating a comfortable, natural environment for our cattle, using low-stress handling and herding methods. Gemstone cattle are born and raised on our farm and enjoy a natural, grain free, nutrient rich diet free from added hormones. In the winter, the cattle remain free to roam in large fields, but are also provided with wind shelter and straw bedding for protection during storms and extreme cold. <br><br> In the spring, summer and fall, our cattle graze on a variety of lush, nutrient dense grasses and other forage. We rotate them through our open pastures often, so they can eat the most nutritious parts of the plant, resulting in high-quality beef that our customers desire. <br><br> To maintain health and growth, cattle finished in the cold winter months are fed a mix of green hay and silage. Silage is chopped up grass, or other green fodder, that is preserved over the winter by airtight fermentation to prevent spoilage. Just like canning vegetables or fruits! Small quantities of sunflower seeds, rolled flax or malt sprouts may also be added for extra energy and nutrition. ethically raised <br> grain free <br> no added hormones or antibiotics <br> no GMO feed <br> grass finished <br><br> Animal care is our top priority. We believe in creating a comfortable, natural environment for our cattle, using low-stress handling and herding methods. Gemstone cattle are born and raised on our farm and enjoy a natural, grain free, nutrient rich diet free from added hormones. In the winter, the cattle remain free to roam in large fields, but are also provided with wind shelter and straw bedding for protection during storms and extreme cold. <br><br> In the spring, summer and fall, our cattle graze on a variety of lush, nutrient dense grasses and other forage. We rotate them through our open pastures often, so they can eat the most nutritious parts of the plant, resulting in high-quality beef that our customers desire. <br><br> To maintain health and growth, cattle finished in the cold winter months are fed a mix of green hay and silage. Silage is chopped up grass, or other green fodder, that is preserved over the winter by airtight fermentation to prevent spoilage. Just like canning vegetables or fruits! Small quantities of sunflower seeds, rolled flax or malt sprouts may also be added for extra energy and nutrition. <br><br> Good for our Customers It contains vitamins A, B6, B12, D, E, minerals like iron and zinc, and essential amino acids. However, research has shown that finishing cattle on a grass fed diet has several health benefits for consumers. <br><br> Some of the health benefits of grass fed beef include: <br> Higher in Vitamin A and E: powerful antioxidants that support healthy vision, skin, bones and other tissues in the body.<br> Two to three times more conjugated linoleic acid: a healthy fat that's been tied to improved immunity and anti-inflammation. Higher concentration of omega-3 fatty acids: essential fatty acids that have been associated with reduced risk of cardiovascular disease, cognitive decline, and other conditions.<br> More desirable omega-6 to omega-3 ratio: Health professionals suggest that a healthy diet consists of 1 to 4 times more omega-6 fatty acids than omega-3 fatty acids. While essential for normal body function, excess amounts of omega-6 can cause inflammation in the body. Studies have shown that grass fed beef repeatedly falls within the healthy 4:1 ratio of omega-6 to omega-3 fatty acids.